During obesity, the increment in beta cell mass in response to the rising demand for insulin is essential to maintain normal glucose homeostasis. However, the precise cellular and molecular mechanisms involved in beta cell mass plasticity remain poorly understood. The Wnt signalling pathway has been suggested as one possible modulator of beta cell proliferation, which represents the principal process involved in beta cell mass expansion. Here, we sought to determine the mechanisms involved in beta cell mass proliferation using diet-induced obese rats. Wistar rats aged 8 weeks old were fed a standard or cafeteria diet. Global transcriptomic analysis of pancreatic rat islets was performed using microarray analysis. Genetic loss-of-function approaches were performed in dispersed primary rat islets and the beta cell line INS1E. Gene expression was measured by real-time PCR, protein levels by immunoblot analysis, proliferation rates by ELISA and apoptosis by flow cytometry. Sfrp5, coding for secreted frizzled-related protein 5, is downregulated in the pancreatic islets of cafeteria-diet-fed rats as well as in the pancreatic islets of human obese patients. We demonstrate that silencing Sfrp5 increases beta cell proliferation, which correlates with activation of Wnt signalling and enhanced levels of proliferation markers. In addition, we show that expression of Sfrp5 in beta cells is modulated by IGF binding protein 3 (IGFBP3) secreted from visceral adipose tissue. Together, these findings reveal an important role for SFRP5 and Wnt signalling in the regulation of beta cell proliferation in obesity. The online version of this article (doi: 10.1007/s00125-013-3030-x) contains peer-reviewed but unedited supplementary material, which is available to authorised users. Obesity has reached epidemic proportions in western civilisation and is a predisposing factor for metabolic disorders, such as type 2 diabetes [1, 2]. There is growing evidence suggesting that adipose tissue influences pancreatic beta cell mass plasticity, which is the capacity of the beta cell to flexibly adapt its mass to increased insulin demands . Several mechanisms have been implicated in adult beta cell mass expansion, with the proliferation of differentiated beta cells proving to be the most important one, at least in rodents [4, 5, 6]. However, the factors and mechanisms regulating the proliferation of pancreatic beta cells remain to be fully clarified. Wnt signalling is critically important for organogenesis and for the determination of cell fate. The transcription factor 7-like 2 (TCF7L2)-dependent Wnt signalling pathway (canonical pathway) is involved in pancreas development, islet function and insulin production and secretion [7, 8, 9]. Recent work has also suggested the participation of Wnt signalling in beta cell proliferation . Canonical Wnt signalling starts with the binding of Wnt proteins to the frizzled receptors, which allows the activation of β-catenin and its translocation into the nucleus, where it interacts with transcription factors, such as TCF7L2, to regulate the expression of several genes . The activity of Wnt signalling is often inhibited by different modulators, such as dickkopfs, Wnt inhibitory factor 1 (WIF1) and secreted frizzled-related proteins (SFRPs). Of these, SFRPs sequester Wnt proteins in the extracellular space and prevent them from binding to their receptors. SFRPs have been extensively studied in the context of cancer [11, 12] and, more recently, in the context of adipose tissue . Several reports have implicated members of the SFRP family, including SFRP5, in adipocyte dysfunction during obesity. For instance, Sfrp5 was reported as highly induced in white adipose tissue (WAT) during genetic and/or diet-induced obesity, whereas others studies described the suppression of Sfrp5 under these conditions [14, 15]. In contrast, recent findings suggest that SFRP5 is neither regulated by obesity nor actively secreted from human WAT . At any rate, little is known about the role of SFRP5 in the control of Wnt signalling in pancreatic beta cells. Only one recent study reported another SFRP gene, SFRP4, as overexpressed in pancreatic islets taken from type 2 diabetic patients, but the authors did not find any changes in SFRP5 . In the present study, we explored the mechanisms involved in beta cell proliferation in the context of obesity by using a diet-induced obese model, namely, rats fed a cafeteria diet (CAF). As previously described, this model presents an increment in beta cell mass, which is partly ascribed to increased beta cell proliferation . By analysing global gene expression, we identified the downregulation of Sfrp5 in pancreatic islets from CAF-fed rats relative to rats fed standard chow. Our results show that SFRP5 knockdown promotes beta cell proliferation, which we correlated with activation of the canonical Wnt signalling pathway. Thus, our study demonstrates an important role for SFRP5 in pancreatic islets and provides a link between SFRP5 and beta cell proliferation during expansion of beta cell mass in obesity. The principles of laboratory animal care were followed (European and local government guidelines), and protocols were approved by the Animal Research Committee of the University of Barcelona (Barcelona, Spain). Seven-week-old male Wistar rats, Zucker rats and ob/ob mice were purchased from Charles River (Wilmington, MA, USA). Wistar rats were caged individually and divided into two dietary sets: one group was fed with a CAF as previously described, while another group was fed with standard chow diet (STD) [17, 18]. The diet was fed for 30 days unless otherwise stated. The animals were allowed to eat and drink ad libitum. At the end of the experiment, animals were anaesthetised and killed by decapitation. Pancreatic islets were isolated from STD- and CAF-fed rats, Zucker rats and ob/ob mice by collagenase digestion . Briefly, pancreases were digested with collagenase (Roche, Basel, Switzerland) and islets were purified from exocrine tissue with Histopaque density gradients (Sigma-Aldrich, St Louis, MO, USA). Islets were handpicked under a stereomicroscope and kept frozen at −80°C until used. Pancreatic human islets were purified from cadaver organ donors (four obese donors and six non-obese donors) from the Transplant Services Foundation of the Hospital Clinic (Barcelona, Spain) and kept at the Biobank of the Hospital Clinic-Institut d’Investigations Biomediques August Pi i Sunyer ([IDIBAPS], Barcelona, Spain), following informed consent from donors’ families and approval by the hospital’s ethics committee. Human islets were isolated as previously described . Inclusion criteria were 50–60 years of age with BMI > 35 kg/m2 for obese and BMI < 25 kg/m2 for non-obese donors. Total RNA was extracted from frozen islets, transfected INS1E beta cells and dispersed cells from islets using the RNeasy MiniKit (Qiagen, Hilden, Germany), according to the manufacturer’s instructions. RNA integrity was analysed using a Lab-On-A-Chip in a 2100 Bioanalyzer (Agilent Technologies, Santa Clara, CA, USA). Total RNA was obtained from islets of rats fed the STD or CAF for 10 and 30 days (four to five animals per group). Total RNA, 10 μg, was converted into cRNA, biotinylated, fragmented and hybridised to GeneChip Rat Genome 230 2.0 (Affymetrix, Santa Clara, CA, USA). Background adjustment, normalisation and data summarisation of raw data were performed by MAS5.0 algorithm using the Simpleaffy package  from bioconductor  on R language . Samples from 10 and 30 days of diet were analysed separately. Raw and processed data successfully passed several quality controls as described previously . In order to increase the sensitivity of the analysis and reduce background noise, those genes that were called absent (calculated with the MAS5.0 algorithm from the Simpleaffy package ) in at least two microarrays using both experimental groups (STD- and CAF-fed groups) were removed. Differentially expressed genes were considered when presenting fold change >1.5 or <−1.5 and Student’s t test p value ≤0.05 in both comparisons (STD 10 days vs CAF 10 days and STD 30 days vs CAF 30 days). Raw and processed data were deposited in the GEO database with the accession number GSE44047. Total RNA was retrotranscribed with Superscript III (Invitrogen, Carlsbad, CA, USA). Real-time PCR was carried out in a 7900 HT Real Time System (Applied Biosystems, Foster City, CA, USA) using a SYBR Green fluorophore. A standard curve of each primer set (rat, human and mouse Sfrp5 primers from Super Array Biosciences, Qiagen) was generated from serial dilutions of cDNA. Expression levels obtained were normalised with a housekeeping gene (TATA box binding protein, Tbp). The Rat WNT Signalling Pathway RT2 Profiler PCR Array (Qiagen) targets 84 genes related to WNT-mediated signal transduction. Total RNA isolated from islets from either CAF- or STD-fed rats was reverse-transcribed into cDNA using the RT2 First Strand Kit (Qiagen), mixed with RT2 qPCR Mastermix containing SYBR Green (Qiagen), and aliquoted in equal volumes to each well of the real-time PCR arrays. The real-time PCR cycling program was run on a Roche Light Cycler 480. The threshold cycle (Ct) of each gene was determined and subsequently analysed by RT2 Profiler PCR Array Data Analysis software (http://pcrdataanalysis.sabiosciences.com/pcr/arrayanalysis.php). Expression profiles were obtained from four independent experiments. Handpicked islets isolated from STD-fed rats were transferred to Petri dishes and pre-cultured overnight in RPMI 1640 medium (Gibco-BRL, Paisley, UK) containing 11.1 mmol/l glucose and supplemented with 10% FBS (vol./vol. ), 2 mmol/l l-glutamine, 100 U/ml penicillin, and 100 μg/ml streptomycin at 37°C with 5% CO2. The protocol for the isolation of single islet cells has been published previously . Islets were digested in PBS containing 0.125 mg/ml trypsin and 0.05 mg/ml EDTA (Gibco-BRL) at 37°C and for an additional 5 min on ice to allow islets to sediment. The cell suspension was cycled for 5 min. Then, the supernatant fraction containing the single cells was removed and placed in 1 ml FBS (Gibco-BRL). To obtain additional single islet cells, the digestion process was repeated a maximum of four times. Once obtained, single islet cells were cultured in RPMI 1640 medium supplemented as detailed before but containing 5.5 mmol/l glucose. INS1E cells were maintained in RPMI 1640 containing 5.5 mmol/l glucose and supplemented with 10% FBS (vol./vol. ), 1 mmol/l sodium pyruvate, 50 μmol/l 2-mercaptoethanol, 2 mmol/l glutamine, 10 mmol/l HEPES, 100 U/ml penicillin, 100 μg/ml streptomycin and 0.1% BSA (Sigma-Aldrich). For stimulation experiments, cells were cultured on microplates for 24 h in a culture medium containing: (1) an aliquot of peripancreatic adipose tissue secretome (diluted 1:3 in INS1E cell medium); (2) IGF binding protein 3 (IGFBP3) antibody (Santa Cruz Biotechnology, Santa Cruz, CA, USA) added to the culture medium at 0.1 and 10 μg/ml; and (3) IGFBP3 protein (R&D Systems, Minneapolis, MN, USA) added to the culture medium at 0.5 μg/ml and 10 μg/ml. Peripancreatic adipose tissue secretome was prepared as previously described [17, 25]. INS1E cells and single rat islet cells were grown on tissue culture test plates in the media previously described. Cells were transfected using Metafectene Pro (Biontex, Martinsried, Germany) at a 1/2 (wt/vol.) ratio with Sfrp5 small interfering (si)RNA (silencer select siRNA) or negative control siRNA (Ambion, Austin, TX, USA), according to the manufacturer’s protocol. RNA and protein were extracted at 48 h for INS1E cells and 72 h for single islet cells, after transfection. The efficiency of Sfrp5 silencing was examined by real-time PCR using Sfrp5 primer set (Qiagen), and by western blot analysis using primary antibodies against SFRP5 (1:50, Santa Cruz Biotechnology, Santa Cruz, CA, USA) and actin (1:1,000; Sigma-Aldrich). Experiments were performed using primary antibodies against SFRP5 (1:50; Abcam, Cambridge, UK and 1:50; Santa Cruz Biotechnology), insulin and glucagon (1:500; Dako, Glostrup, Denmark). Anti-rabbit-phycoerythrin, anti-guinea pig-Cy2, anti-goat-Cy3 (1:500, Santa Cruz Biotechnology)-conjugated, and aminomethylcoumarin acetate (AMCA) anti-guinea pig (1:200; Jackson ImmunoResearch, Newmarket, UK) antibodies were used as secondary antibodies. Fluorescence images were analysed with a Leica confocal scanning laser microscope (Leica Microsystems, Wetzlar, Germany). The proliferation of INS1E and dispersed islet cells was assessed at 48 h (INS1E) or 72 h (single islets cells) following siRNA transfection, using the cell BrdU Proliferation Kit (Roche) and following the manufacturer’s protocol. BrdU was added over 24 h. Irrelevant IgG (Dako), SFRP5 antibody (Abcam) and IGFBP3 antibody (Santa Cruz Biotechnology) were added to the media at 0.1 μg/ml. SFRP5 recombinant protein (R&D Systems) was added to the media at 0.1 μg/ml. Cell growth was measured by cell counting. Briefly, 150 × 103 INS1E cells were plated on 12-well tissue culture plates, transfected with siRNAs as previously described and counted in a Countess automated cell counter (Invitrogen) 48 h after transfection. Islets and transfected cells were homogenised in lysis buffer containing 50 mmol/l Tris–HCl, pH 7.3, 150 mmol/l NaCl, 5 mmol/l EDTA, 10% glycerol, 1% Triton X-100 and protease inhibitors (Roche). Homogenates were subjected to two freeze–thaw cycles. After centrifugation, supernatant fractions were recovered and kept at −80°C. Protein concentrations were determined with the BCA protein assay (Pierce). Proteins were separated by SDS-PAGE and transferred to polyvinylidene difluoride (PVDF) membranes using standard protocols. The membranes were blocked for 1 h in PBS containing 0.05% Tween-20 and 5% skimmed milk. They were then incubated overnight at 4°C with antibodies against SFRP5 (1:500; Santa Cruz Biotechnology), dephosphorylated β-catenin (1:1,000; Millipore, Bedford, MA, USA), β-catenin (1:1,000; Cell Signaling, Beverly, MA, USA), Akt and proliferating cell nuclear antigen (PCNA) (1:500 and 1:1,000, respectively; Santa Cruz Biotechnology), cleaved caspase 3, mitogen-activated protein kinase p44/42 (MAPK), phospho-MAPK, phospho-Akt and phosphatidylinositide 3-kinase (PI3K) (1:1,000; Cell Signaling), TCF7L2 (1:5,000; Abcam) and actin (1:1,000; Sigma-Aldrich). Horseradish peroxidase-conjugated anti-rabbit and anti-mouse antibodies were used as secondary antibodies (1:2,000; Amersham, Biosciences, Buckinghamshire, UK). The complex was visualised with enhanced chemiluminescence (ECL, Amersham Biosciences) on a Luminescent Image Analyzer (Image Quant LAS 4000). Intensity values were obtained with Image J software, version 1.47 (http://rsbweb.nih.gov/ij/). All data are expressed as means ± SEM. Differences were analysed by Student’s paired or unpaired t test. A value of p< 0.05 was accepted as statistically significant. In order to investigate the molecular mechanisms altered in pancreatic islets during the development of obesity, we compared the islet transcriptome of CAF- and STD-fed rats. Among the differentially expressed genes, we identified the gene encoding SFRP5, which was downregulated in CAF-fed relative to STD-fed rat islets (electronic supplementary material [ESM] Table 1). Decreased SFRP5 expression in CAF-fed islets was confirmed at both the mRNA (Fig. 1a) and protein levels (Fig. 1b). The mRNA expression of Sfrp5 was also found to be lower in the pancreatic islets from two different models of obesity, ob/ob mice and Zucker rats (Fig. 1c), further corroborating altered islet Sfrp5 expression in obesity. Finally, we confirmed these results in isolated islets from human obese patients, which showed decreased levels of SFRP5 mRNA compared with control patients (Fig. 1d, 0.56 ± 0.20 vs 1.02 ± 0.08; p< 0.01). Taken together, these data provide evidence that islets exhibit decreased Sfrp5 expression in obese states. SFRP5 is an inhibitor of Wnt signalling, and the Wnt signalling pathway is known to regulate beta cell proliferation [10, 12]. Hence, we hypothesised that the downregulation of Sfrp5 expression might be involved in enhanced beta cell proliferation in islets from CAF-fed rats. As an initial step, we performed staining with an antibody against SFRP5 in fixed pancreatic tissue from control rats and found co-localisation of SFRP5 with insulin (Fig. 2a), thus confirming the presence of SFRP5 in beta cells. Next, to investigate the role of SFRP5 in proliferation, we assessed BrdU incorporation in dispersed pancreatic islet cells transfected with an siRNA targeting Sfrp5. The efficiency of the siRNA knockdown was validated for both mRNA and protein (Fig. 2b, c). The percentage of cells positive for BrdU increased significantly when we silenced Sfrp5 (Fig. 2d, 132.40% ± 4.60; p< 0.05 vs control siRNA) without any detectable effect on apoptosis, as measured by annexin V and propidium iodide labelling (ESM Methods and ESM Table 2). Furthermore, blocking SFRP5 protein with an antibody induced the same increase in proliferation as seen when Sfrp5 was silenced with siRNA (Fig. 2e). Conversely, incubation with an SFRP5 recombinant protein resulted in decreased proliferation (Fig. 2f). As single islet cell cultures contain several endocrine types, we performed additional experiments using the rat beta cell line INS1E. INS1E cells transfected with the siRNA against Sfrp5 exhibited lower Sfrp5 mRNA expression and decreased SFRP5 protein levels compared with cells transfected with control siRNA (Fig. 3a–c). As we had seen in dispersed islet cells, SFRP5 knockdown led to a significant increase in proliferation rates in INS1E cells (Fig. 3d, 151.13% ± 9.60; p< 0.05 vs control siRNA), which correlated with higher cell number in Sfrp5 siRNA transfections compared with control siRNA (Fig. 3e; p< 0.01). We also determined the effect of Sfrp5 silencing on beta cell apoptosis but found no difference between cells transfected with Sfrp5 siRNA and those transfected with control siRNA (ESM Methods and ESM Table 2). In summary, these results confirm that SFRP5 can modulate beta cell proliferation both in primary islet cells and in a beta cell line. We next examined whether Sfrp5 downregulation correlated with changes in the activity of the Wnt pathway in islets from CAF-fed rats. We first checked the status of the canonical Wnt pathway by determining expression levels of its characteristic protein, β-catenin. As shown in Fig. 4a, the amount of dephosphorylated β-catenin was increased relative to total β-catenin in islets from CAF-fed rats, thus indicating activation of the canonical Wnt pathway. This correlated with increased expression of PCNA (an indicator of increased proliferation) but undetectable levels of cleaved caspase 3 (Fig. 4b). To obtain a more global picture of the Wnt signalling status in islets from CAF-fed rats, we examined expression of a panel of genes related to this pathway in islets from CAF- and STD-fed rats. We observed an increase in the expression of several genes in CAF-fed rats (Table 1) including Wnt ligands, Wnt receptors, Tcf7 and target genes such as cyclin D1 and Myc. To establish a direct role of SFRP5 on the activation of the canonical Wnt pathway in beta cells, we assessed whether Sfrp5 silencing impacted this pathway in INSE cells. We found increased levels of β-catenin (dephosphorylated form) and TCF7L2 by western blot analysis in Sfrp5 siRNA-transfected cells compared with control cells (Fig. 4c). In addition, we observed translocation of β-catenin to the nucleus in SFRP5 knockdown cells, whereas β-catenin was found mainly located in the cytoplasm of control cells (ESM Methods and ESM Fig. 1). Together, these data link Sfrp5 downregulation with activated canonical Wnt signalling in beta cells. Next we evaluated whether SFRP5 could influence other signalling pathways known to regulate beta cell proliferation. INS1E transfected with Sfrp5 siRNA presented increased levels of phospho-Akt, PI3K and phospho-MAPK (Fig. 5a), thus suggesting that these other pathways could also contribute to enhanced proliferative capacity of SFRP5 knockdown cells. Last, we determined the status of these pathways in islets from CAF-fed rats and found similar results (Fig. 5b). We previously showed that the visceral adipose tissue of CAF-fed rats exerts pro-proliferative effects on beta cells in vitro, thus providing evidence for the involvement of adipose-derived signals in beta cell mass expansion in obesity . To determine whether Sfrp5 expression in pancreatic islets could be influenced by secreted factors from adipose tissue, we investigated the effect of the secretome obtained from the peripancreatic adipose tissue of CAF- and STD-fed rats on INS1E cells. We observed that Sfrp5 mRNA levels decreased in INS1E cells exposed to the adipose-derived secretome from CAF-fed rats but not that from STD-fed rats (Fig. 6a), indicating that adipose-derived signals can influence beta cell expression of this Wnt component. IGFBP3 is decreased in the secretome of peripancreatic adipose tissue and may be involved in pancreatic beta cell proliferation in obese states . Thus, here we investigated if IGFBP3 modulated the expression of Sfrp5 in beta cells. To this aim, we cultured INS1E cells in the presence of IGFBP3 recombinant protein or an antibody against IGFBP3 (which sequesters IGFBP3 protein). Exogenous IGFP3 significantly increased Sfrp5 mRNA levels, whereas the IGFBP3 antibody lowered Sfrp5 mRNA expression in INS1E cells (Fig. 6a). Finally, we measured the effects of recombinant IGFBP3 and the IGFBP3 antibody on cell proliferation in single islet cell cultures transfected with the siRNA against Sfrp5 or the control siRNA. We observed further enhancement in proliferation when Sfrp5 was silenced in the presence of IGFBP3 antibody compared with cells that were transfected with control siRNA and treated with the same antibody (Fig. 6b). Therefore, our data demonstrate that IGFBP3 can modulate Sfrp5 expression and beta cell proliferation and thus reveal a possible link between adipose-derived signals and intrinsic beta cell proliferative pathways. 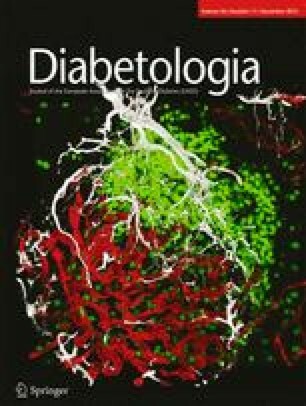 Lifelong maintenance of appropriate beta cell mass is essential for normal glucose homeostasis. Consequently, there is growing interest in understanding the mechanisms that control beta cell expansion during times of increased metabolic demand such as during obesity . Several studies have demonstrated that beta cell mass is increased in rodent obese models, mainly due to increased beta cell proliferation. However, the mechanisms underlining enhanced proliferation in obesity remain poorly understood. Here, we show that the Sfrp5 gene is downregulated in the islets of CAF-fed rats as well as in other obese rodent models. Importantly, we find that SFRP5 mRNA levels are also decreased in pancreatic islets from obese human donors. Using cell-based assays, we demonstrate that Sfrp5 silencing promotes beta cell proliferation and activation of the canonical Wnt signalling pathway. Finally, we provide evidence of the modulation of Sfrp5 expression and beta cell proliferation through IGFBP3 availability. There is strong evidence that the Wnt signalling pathway regulates prenatal and postnatal beta cell development in mice as well as glucose sensing in pancreatic beta cells [27, 28]. Also, the activation of Wnt signalling in beta cell lines or in isolated islets has been shown to enhance beta cell proliferation [10, 29, 30, 31]. Thus, increased β-catenin levels in islets caused an expansion of beta cell mass, whereas the depletion of TCF7L2 reduced proliferation in human islets [10, 30]. In the current study, we show that Sfrp5 silencing activates proliferation in INS1E and dispersed islet cells, which is accompanied by increased β-catenin and TCF7L2 levels in both cellular models. Together, this evidence supports the notion that Sfrp5 can regulate the canonical Wnt pathway in beta cells. Correlating with these data, islets from CAF-fed rats exhibit upregulation of several genes involved in the Wnt pathway, as well as of well-known Wnt targets implicated in cell cycle progression such as cyclin D1 and Myc . Recent observations have offered a new perspective on SFRP family functions and mechanisms of action in both pancreatic development and disease [11, 12]. Ouchi et al reported that two independent mouse models of obesity exhibited reduced SFRP5 in adipose tissue, suggesting that this molecule could be involved in the development of obesity . According to Schulte et al, SFRP5 represents a new regulatory system in low-grade inflammation in obesity, which could be influenced by nutritional therapy . Recently, in contrast to these findings, SFRP5 expression was found unchanged in human WAT . In agreement with this study, we found no changes in circulating SFRP5 levels or in Sfrp5 expression in peripancreatic adipose tissue between CAF- and STD-fed rats (data not shown). Therefore, its implication in metabolic dysfunction remains controversial [34, 35, 36]. Importantly, our study demonstrates a novel autocrine role for SFRP5 in beta cell proliferation. Several Wnt proteins appear to have both canonical and non-canonical properties . Our results show that, in addition to β-catenin-dependent signalling, SFRP5 has effects on the MAPK and PI3K pathways. Information available on SFRP5 is limited, thus we cannot rule out multiple effects of this protein. However, it is possible that these additional activation events are consequent of the crosstalk between the Wnt pathway and MAPK or PI3K, described elsewhere [37, 38]. Recently, Gherzi et al reported that the half-life of β-catenin mRNA is prolonged not only by Wnt but also by PI3K–Akt signalling, adding further complexity to the potential mechanisms by which insulin/IGF-1 could interact with Wnt signalling . With the data available, we cannot dismiss the possibility that these different signalling events could converge to activate beta cell proliferation. Recently, we described that reduced IGFBP3 secretion by the peripancreatic adipose tissue of CAF-fed rats induced beta cell proliferation. Our data reveal that decreased IGFBP3 leads to a reduction in Sfrp5 mRNA expression. These findings are in line with the increased beta cell proliferation previously described in CAF-fed rats and provide additional proof of the existence of a crosstalk between adipose tissue (IGFBP3) and beta cells (SFRP5). Remarkably, the increment in beta cell proliferation observed in SFRP5-knockdown beta cells can be further enhanced by blocking exogenous IGFBP3 levels, which suggests a synergic effect of decreased IGFBP3 and SFRP5 on beta cell proliferation. Little is known regarding the regulation of Sfrp5 expression. Of note, insulin, IGF-1 and other hormonal factors have been shown to activate the canonical Wnt signalling by increasing nuclear β-catenin content and binding of β-catenin/TCF to Wnt target gene promoters [39, 40, 41]. Thus, it is plausible that IGFBP3 and SFRP5 are two of the molecules mediating the crosstalk between the Wnt and insulin/IGF-1 signalling pathways at the level of pancreatic beta cells in the context of diet-induced obesity. These findings deserve further investigation. In summary, our results offer an improved understanding of the mechanisms underlying beta cell proliferation in obesity, pointing to the downregulation of Sfrp5 expression as one crucial mechanism that may represent a new therapeutic target for the modulation of pancreatic beta cell mass expansion. We are indebted to the Cytomics Unit of IDIBAPS for technical help. We thank Rosa Gasa (IDIBAPS) for critical reading and discussion of the manuscript, Marcelina Párrizas (IDIBAPS) for invaluable guidance during the transfection experiments and Kimberley Katte (CIBERDEM) for revising the manuscript. JMO was the recipient of a doctoral research fellowship (SFRH/BD/45845/2008) supported by the Portuguese Foundation for Science and Technology (FCT) and funding by the Operational Program for Human Potential (POPH/ESF), and JA was the recipient of a grant from IDIBAPS. This work was developed at the Centro Esther Koplowitz, Barcelona, Spain. This work was sponsored by the Spanish Ministry of Science and Innovation (under grant agreement number SAF 2010-19527), the Government of Catalonia (under grant agreement number 2009 SGR 1426), the Botín Foundation (project 08/351) and the European Community’s Seventh Framework Programme (FP7/2007-2013) under grant agreement numbers 218130 and 267248. CIBERDEM is an initiative of the Spanish Ministry of Science and Innovation (ISCIII). This research project was also supported by a Marie Curie People Cofund Fellowship of the Seventh Framework Programme of the European Commission under grant agreement number 267248: DIATRAIN. SAR and RG designed the study. All authors contributed to acquisition or interpretation of data, drafted the article or revised it critically for important intellectual content the paper. All authors approved the final version of the manuscript to be published.